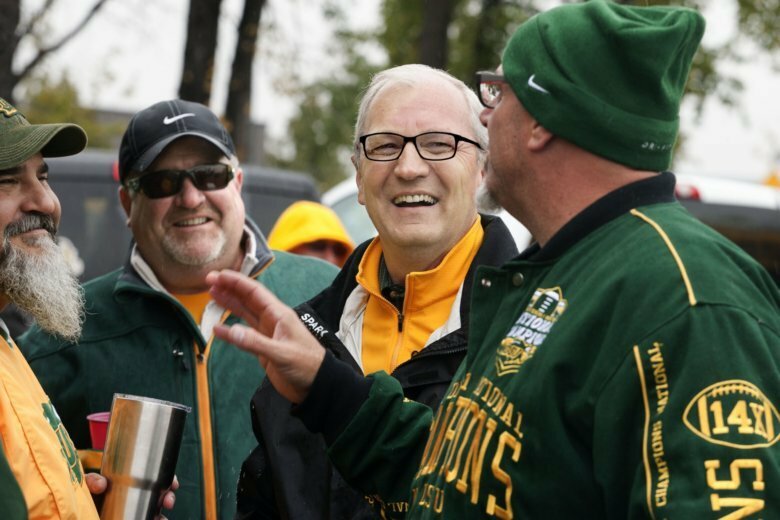 FARGO, N.D. (AP) — As he made his way through a parking lot full of tailgating North Dakota State University football fans on a recent rainy weekend, there was no question Rep. Kevin Cramer is President Donald Trump’s guy. People awaiting kickoff with spreads of food and drink greeted the Republican Senate candidate with good wishes and some free campaign advice: Stick with the president. One man called out to Cramer, shouting, “You’ve got my vote” and “MAGA,” the acronym for Trump’s 2016 campaign slogan, “Make America Great Again,” which supporters still use as a rallying cry. The three-term congressman and early Trump supporter has made loyalty to the president in a state that overwhelmingly supported him in 2016 the main selling point of his campaign to unseat Democratic Sen. Heidi Heitkamp. It’s an argument that put Heitkamp in a bind over how to vote on Brett Kavanaugh, Trump’s nominee to the Supreme Court. She said Thursday she will vote no, a decision that will embolden Cramer and his supporters to try to paint Heitkamp as out of step with North Dakota. Even before the Kavanaugh controversy, the Senate race here was among a handful of close contests that could decide whether Republicans keep control of the Senate, where they have a 51-49 majority. Heitkamp, a first-term senator and former state attorney general, is one of 10 Democratic senators trying to win in states Trump carried in November, and her fight may be tougher than most. Trump won North Dakota by 36 points, his best showing in any state where a Senate Democrat is seeking re-election except West Virginia. Heitkamp argues North Dakota voters don’t want hyper-partisan lawmakers. She has supported many of Trump’s Cabinet and judicial nominees, including Supreme Court pick Neil Gorsuch. However, she has opposed him on issues such as his tax cut bill and his tariffs on China, which she says have hurt many North Dakota farmers. Yet even as some Republicans elsewhere distance themselves from Trump, Cramer has maintained he is “100 percent” with Trump on issues important to North Dakota. Trump has rewarded him with two visits this year, including a rally in Fargo that drew thousands. Trump and Cramer are something of a natural pairing. They both have a reputation for making the kind of unfiltered comments that can provoke outrage, particularly from liberals and other critics. Earlier this year Cramer said farmers raising concerns about the trade war needed a “higher pain threshold.” Last week he made headlines for his comments about Kavanaugh, who’s been accused by Christine Blasey Ford of sexually assaulting her while they were in high school. She testified Kavanaugh held her down and covered her mouth while trying to take off her clothes; Kavanaugh has denied the allegations. Heitkamp criticized Cramer for the remarks, saying they diminished the severity of assault allegations. She suggested last week she had concerns about Kavanaugh’s confirmation, saying there are many qualified lawyers who could do the job. A confirmation vote could be held this week. The remarks, and the candidates’ stances on Kavanaugh, got a mixed reception from voters. Robyn Bancroft, who was eating breakfast at a Grand Forks cafe with her daughters when Heitkamp stopped in last week, had a one-word reaction to Cramer’s remarks: “Disgusting.” She said she had a hard time watching the hearings, and “absolutely” wanted Heitkamp to vote no. But others don’t have a problem with Cramer’s comments — and even appreciate his straight talk. Diane Andersen, a 58-year-old who owns a hardware store about 70 miles outside of Bismarck, also is unbothered by Cramer’s say-what-you-think style. “We know where he’s coming from,” she said. Cramer said he “enjoyed every minute” of the latest brush-up over his comments, which he called another attempted “gotcha” from the Washington press corps. Heitkamp has campaigned heavily on issues like health care, which she says comes up constantly as she speaks with voters. She supports the Affordable Care Act, particularly its protections for pre-existing conditions, and says she wants to fix what doesn’t work while her opponent wants to get rid of it entirely. That could be devastating for rural health care, she says, a big issue in the predominantly rural state. She also takes issue with Cramer’s support for Trump’s tariffs. China has retaliated by slapping its own taxes on crops such as soybeans, a blow to a state that sends 70 percent of its soybeans there. Mark Dickson, who farms outside of Grand Forks, told Heitkamp the local co-op has trains loaded up with soybeans and ready to move out, but “they can’t sell them.” The 61-year-old, who supported Clinton in 2016 and plans to vote for Heitkamp, said he’d feel better about Cramer if the congressman did something to show solidarity with farmers, such as donating part of his salary to a food bank. “It is starting to really affect my bottom line and a lot of farmers’ bottom line,” he said. But Gadberry said he’s a conservative, and his concerns about trade aren’t enough to turn his back on Cramer. The 58-year-old said Cramer’s parents are about the same age as his own parents, and he trusts him on Medicare and Social Security, which his parents rely on and Gadberry will soon too. Associated Press reporter James McPherson contributed from Bismarck, N.D.